Background: Type 2 diabetes mellitus (T2DM) and thyroid dysfunction (TD) often present together and complicate each other at many levels. Methodology: In this prospective study, we determined the prevalence of TD among 700 patients with T2DM attending the diabetes clinic of a tertiary care hospital who were recruited. Various sociodemographic factors such as age, gender, marital status, literacy status, and habits and clinical profile were assessed. Results: In all, 68% of male and 31% of female patients were enrolled in this study. About 33.5% of males and 66.4% of females were found with TD. One hundred and fifty-two (21.7%) patients were having TD. Diabetes and TD were more common among females, with advancing age, 45–70 years, sedentary, overweight patients and having familial history. Twenty-five percent of the patients were having prehypertension. About 10.5% of the patients were suffering with hyperthyroidism and 9% were suffering from subclinical hyperthyroidism. Forty-two percent were suffering from hypothyroidism, while 36% had subclinical hypothyroidism. Ten percent had higher T3 hormone levels, 11% had higher T4 hormone levels, and 69% had increased thyroid-stimulating hormone levels. Three percent of patients with diabetes and TD were having cardiovascular diseases. Conclusions: Out of 700 patients with T2DM, 21% were having different kinds of TD. More females with advancing age and sedentary lifestyle were having TD. Screening for TD among diabetes patients could improve case detection and early treatment, indirectly leading to better thyroid-specific treatment outcomes and prevention of DM complications. Type 2 diabetes mellitus (T2DM) and thyroid dysfunction (TD) are common endocrine disorders usually encountered in clinical practice. Diabetes and thyroid disorders have been shown to mutually influence each other, and association between both conditions has long been reported., The prevalence (6.6%) of thyroid disease is common in the general population and increases with age. The prevalence of thyroid disease in diabetes has been estimated at 10.8%, with the majority of cases occurring as hypothyroidism (~30%) and subclinical hypothyroidism (~50%). Hyperthyroidism accounts for 12% and postpartum thyroiditis accounts for 11%., Both diabetes and thyroid disorders are autoimmune in nature. Patients with one organ-specific autoimmune disease are at risk of developing other autoimmune disorders. The presence of TD affects diabetes control. Whereas hyperthyroidism is associated with worsening glycemic control and increased insulin requirements, there are underlying increased hepatic gluconeogenesis, rapid gastrointestinal glucose absorption, and increased insulin resistance. In fact, thyrotoxicosis may unmask latent diabetes. Hypothyroidism, on the other hand, is accompanied by a variety of abnormalities in plasma lipid metabolism, including elevated triglyceride and low-density lipoprotein (LDL) cholesterol concentrations, leading to increased risk of atherosclerosis., In this study, we have estimated the prevalence of TD among patients with T2DM attending diabetes clinic in Bhubaneswar in the state of Odisha and determined the various risk factors and the association with between both the conditions. Our study is the first of its kind in this region of the state. This review summarizes the studies on TD among patients with T2DM by authors in other regions of India. It might serve the purpose of quick reference for epidemiologists, clinicians, students, and researchers. The detailed plan of study was submitted to the Ethics Committee as well as the Scientific Advisory Committee of the institute. This was a prospective study among patients with T2DM to study the prevalence of TD and to identify the risk factors such as hypertension, socioeconomic status, body mass index (BMI), smoking, and alcohol. This study was conducted from March 2017 to March 2018 in the Department of NCDs, Regional Medical Research Centre, Bhubaneswar. Study participants were recruited from patients who attended the Diabetes Clinic/Department of Endocrinology at the Aditya Care Hospital, Bhubaneswar. Aditya Care Hospital is the largest, private, multi-super-specialty corporate hospital in the city. The Care Hospital Group has been the leader in heart care. They have also emerged as the preferred multi-super-specialty destination for patients from all over India. About 20 patients attend the diabetes clinic per week, 80 per patients per month (960/year), and 1920/2 years. Patients with T2DM of >1-year duration, age 18 years and above, and residing in and around the city of Bhubaneswar were included in the study. Patients below 18 years of age, pregnant or lactating women, patients suffering from malignancy and tuberculosis or recently diagnosed diabetics patients, or those on drugs known to affect thyroid function were excluded from the study. During the study period, about 1000 patients with T2DM attended the Diabetes Clinic of Aditya Care Hospital in Bhubaneswar. Out of this, 700 were enrolled after taking written informed consent. Sociodemographic, anthropometric, and clinical profiles such as age, gender, marital status, literacy status, occupation, weight (in kg), BMI (weight, height, and waist circumference), lifestyle (sedentary/active), familial history (parents/siblings), habits (smoking, alcohol, and gutka), duration of illness, type of TD (hyper/hypothyroidism), and complications at the time of testing were collected from all patients using standardized questionnaires. Blood samples for screening were collected from adults willing to participate in the study. About 3 ml was collected aseptically in K3-ethylenediaminetetraacetic acid vacuutainer tubes by antecubital venipuncture. The sera samples collected after centrifugation at 2500 g were tested by enzyme-linked immunosorbent assay (ELISA). In addition to a thorough clinical evaluation, other investigations were done. Fasting blood glucose levels and thyroid hormone profile were estimated for all patients to assess the severity of diabetes and type of TD. Based on thyroid hormone profile, hypothyroidism and hyperthyroidism were categorized. The investigations were correlated with clinical symptoms. Classification of the patient's illness for further management was done based on results of thyroid hormone profile and T2DM status. The TD screening process was started in March 2017 and was performed when the patient visited the clinic. Screening was done on every patient visit. In this study, the results of screening on the first visit have been described. Those subsequently diagnosed with TD were referred to the endocrinology unit for treatment. All patient data were recorded on treatment cards and captured in an electronic database. Signs and symptoms of TD were recorded using standardized questionnaires. Details about treatment were noted from their treatment card. Thyroid function tests such as T3, T4, thyroid-stimulating hormone (TSH), and thyroid autoimmunity, namely antithyroid peroxidase (anti-TPO) antibodies and antithyroglobulin (anti-TG) antibodies, were measured by ELISA (ALKOR-BIO). The diagnostic criteria were as follows: normal: below 5.7%, prediabetes: 5.7%–6.4%, and diabetes: 6.5% or greater. Based on the nature/severity of the disease and the patient's exposure to previous antithyroid treatments, the patients have been categorized into two types, hypothyroidism and hyperthyroidism, and both the forms have their subclinical types. The normal readings are as follows: T3 – 0.7–2.0 ng/ml, T4 – 4.5–11.0 μg/dl, and TSH – 0.4–5.0 μIU/ml. SPSS version 2017 was used for statistical analysis. Prevalence is reported with 95% confidence intervals calculated considering the design effect. All variables were described as proportions, and differences between groups were compared for statistical significance using the Chi-square test and t-test, as applicable. P <0.05 was considered statistically significant. In all, 700 patients with T2DM, attending the diabetes clinics from urban and rural areas, were recruited after taking informed consent. 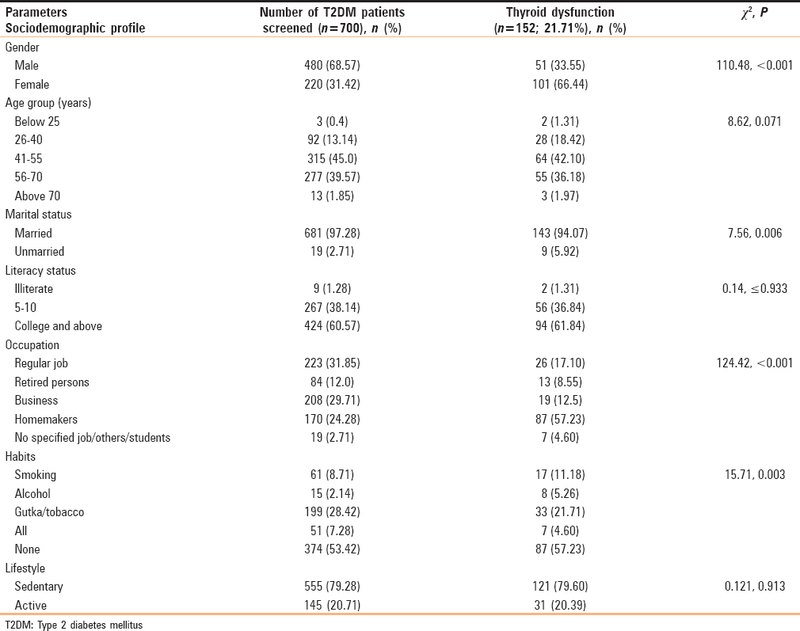 [Table 1] shows the sociodemographic profile of patients with T2DM and TD. There is gender bias in patients attending the diabetes clinics. In all, 68% (480) of male and 31% (120) of female patients were enrolled in this study. About 33.5% (51) of males and 66.4% (101) of females were found with TD. This shows that more females were affected with thyroid disorders. Both T2DM and TD patients were categorized into five age groups. While very less patients with diabetes were in the age group of <25 years and >70 years, about 45% were in the age group of 41–55 years and 39.5% in age group of 56–70 years. Among these, 42% in the age group of 41–55 years and 36% in age group of 56–70 years were having TD as well. This shows that diabetes and TD were more common with advancing age, 45–70 years. Among the patients included in the study, >90% of the patients with diabetes and TD as well as thyroid disorders were married. Among patients with diabetes and TD, less percentage were illiterate, and 38% (267) and 36% (33) had studied up to high school. Around 60% of the patients had studied in college. This shows that persons with both diabetes and TD were well educated. Among the patients with diabetes and TD, 31% had regular job, 29% had business, and 24% were homemakers. Seventeen percent of patients with regular job and 57% of homemakers were having TD. This could be due to prolonged sitting hours owing to desk job among those having job or viewing TV while at home for homemakers. Among 700 patients included in our study, 79% each with diabetes as well as TD were sedentary. Being sedentary is a risk factor for developing both the conditions, diabetes and TD. Around 28% of the patients with diabetes and 21% with TD were addicted to chewing gutka/tobacco, 8% were smokers, and very few patients consumed alcohol occasionally. Gutka/tobacco chewing is common in this region of the state and is a risk factor for many diseases, whereas >50% of patients with diabetes and TD patients did not have any such addictive habits. [Table 2] shows the anthropometric profile of patients with diabetes and TD. With reference to hypertension, about 31% (223) of patients with diabetes and 28% (43) of patients were having blood pressure in the normal range (90–119/60–79) mm/Hg and >25% of the patients were having prehypertension (120–139/80–90) and Stage 1 hypertension (140–159/90–99), while 15% were having Stage 2 hypertension (>160/>100). Hypertension is a risk factor for type 2 diabetes as well as thyroid disorders. As regards BMI, 41% patients with T2DM were obese and 50% and more patients with TD were overweight. This shows that overweight and obese people mainly suffer with metabolic syndrome and diabetes as well as TD. Nineteen percent of patients with T2DM and TD had familial history, i.e., one of the parents/family member was having either diabetes or thyroid disorder. [Table 3] shows the clinical profile of patients with diabetes mellitus and TD. In all, 152 (21.7%) patients were having TD. About 10.5% (16) of the patients were suffering with hyperthyroidism and 9% (15) were suffering from subclinical hyperthyroidism. Forty-two percent (65) were suffering from hypothyroidism, while 36% (56) had subclinical hypothyroidism. 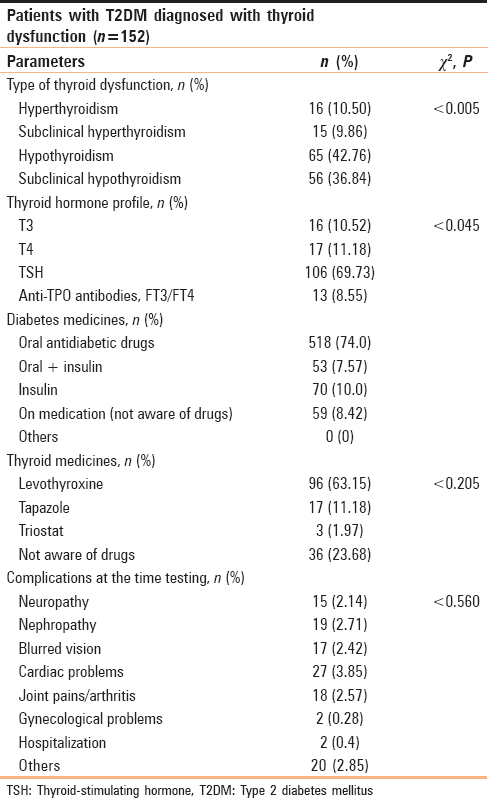 This shows that subclinical hypothyroidism was the most common TD among patients with T2DM. Sixty-eight patients with diabetes were also having TDs. Ten percent (16) had active T3 profile, 11% (17) had active T4 profile, and 69% (106) had increased TSH levels. Sixty-three percent (96) patients were taking levothyroxine, 11% (17) were consuming Tapazole, 1% (3) were taking Triostat, while 23% (36) were taking medicines but unaware of the type of medicines. Thus, levothyroxine appeared to be the most commonly used drug. Among 700 patients with diabetes, 74% (518) were taking oral antidiabetic medicines, 7.5% (53) were taking insulin with oral medicine, 10% (70) were taking only insulin, while 8% (59) were under treatment but unaware of the type of medicines. This shows that more patients were taking oral hypoglycemic drugs. Metformin has effects on the thyroid hormone regulation. With regard to complications, among patients with diabetes and TD, about 2% each were suffering with joint pains/arthritis, blurred vision, neuropathy, and nephropathy. Few (0.2%) were having gynecological problems, while 0.4% (2) were hospitalized due to critical conditions. In this study, 3% (27) patients with diabetes and TD were having cardiovascular diseases. In this study, we determined the prevalence and risk factors for TD among patients with diabetes. Out of 700 patients, 152 (21%) were having TD. Further, subclinical hypothyroidism was more among females having family history of TD and in older patients with long duration of diabetes. About 10.5% of the patients were suffering with hyperthyroidism and 9% were suffering from subclinical hyperthyroidism. About 42% were suffering from hypothyroidism, while 36% had subclinical hypothyroidism. Subclinical hypothyroidism was the most common TD among patients with T2DM. TDs are more common in females having type 2 diabetes, and those diabetics with f 69% had increased TSH levels. In this study, 3% of patients with diabetes and TD were having cardiovascular diseases. The strengths of this study are that we implemented screening within the routine health system with no special budget allocated to support these activities. The early identification of patients with comorbidity, especially among the newly diagnosed cases, is crucial in helping us to link these patients to appropriate DM care, which could lead to improved treatment outcomes. Screening for thyroid using a symptom-based approach is cost-effective. Diabetes management during thyroid treatment needs to be monitored individually through estimation of blood glucose levels, supervision of diabetic medications, and checking for complications/comorbidities at regular intervals. This study was a hospital-based analysis of the T2DM-thyroid comorbid patients, and the findings might not be generalizable. Limitations are we could screen small number of patients and analyze the data over a short period of time. About 10% of T2DM patients did not agree for a fasting blood test and 15% of patients with TD did not opt for an HbA1C and other blood tests. TD is common in diabetic patients and can produce significant metabolic disturbances. Therefore, regular screening for thyroid abnormalities in all diabetic patients will allow early treatment of subclinical TD. T2DM and thyroid diseases have a significant association (P < 0.005). Subclinical hypothyroidism and hypothyroidism were the most common thyroid abnormality in T2DM. TD was more prevalent in female diabetic patients than in males. TD was associated with worsening dyslipidemia in T2DM. It is known that undiagnosed TD in diabetics increases the cardiovascular risk in these patients. Hence, screening for TD among diabetic patients should be routinely performed to reduce the morbidity and mortality. We thank the Director of Aditya Care Hospital, Bhubaneswar, for granting us permission to conduct the study. We also acknowledge the services rendered by Niranjan Sahoo and Minaketan Barik, Technicians, for coordination and assistance in the study. We are indebted to all the diabetic patients, who have cooperated throughout the study period. American Diabetes Association. Standards of medical care in diabetes–2013. Diabetes Care 2013;36 Suppl 1:S11-66. Hage M, Zantout MS, Azar ST. Thyroid disorders and diabetes mellitus. J Thyroid Res 2011;2011:439463. Han C, He X, Xia X, Li Y, Shi X, Shan Z, et al. Subclinical hypothyroidism and type 2 diabetes: A systematic review and meta-analysis. PLoS One 2015;10:e0135233. Granner DK. Thyroid hormones. In: Murray RK, Granner DK, Mayes PA, Rodwell VW, editors. Harper's Biochemistry. Vol. 25. London: Prentice-Hall International Inc.; 2000. p. 533-8. Nicholas A. Type 2 diabetes mellitus and thyroid dysfunction: An intertwined duo. Afr J Diabetes Med 2014;22:5-7. Vaidya R. Association of thyroid dysfunction and diabetes mellitus: Is the co-existence incidental? J Obes Metabol Res 2014;1:83-4. Wu P. Thyroid disease and diabetes. Clin Diabetes 2000;18:38. Afrin S, Sarkar CR, Zahid AT, Ahmed N. Thyroid function in type 2 diabetes mellitus. J Bangla Soc Physiol 2017;12:61-4. Al-Geffari M, Ahmad NA, Al-Sharqawi AH, Youssef AM, Alnaqeb D, Al-Rubeaan K, et al. Risk factors for thyroid dysfunction among type 2 diabetic patients in a highly diabetes mellitus prevalent society. Int J Endocrinol 2013;2013:417920. Ghazali SM, Abbiyesuku FM. Thyroid dysfunction in type 2 diabetics seen at the university college hospital, Ibadan, Nigeria. Niger J Physiol Sci 2010;25:173-9. Khan NZ, Muttalib MA, Sultana GS. Association of thyroid hormone levels among Type 2 Diabetic patients attending a tertiary care hospital. Bangl Med Res Council Bull 2016;42:90-4. Maskey R, Shakya DR, Baranwal JK, Lavaju P, Karki P, Poudel SK, et al. Hypothyroidism in diabetes mellitus patients in Eastern Nepal. Indian J Endocrinol Metab 2015;19:411-5. Ahmed A. A study on prevalence of hypothyroidism in diabetics. Int J Med Sci Educ 2014;1:120-4. Anil KR, Narashimha Shetty KR, Lalitha R, Shetty SB. Prevalence of thyroid dysfunction among type 2 diabetes subjects in South India. Int J Clin Cases Invest 2014;5:93-100. Anveetha P, Rao KP, Chittimoju VK. Study of thyroid profile in patients with type 2 diabetes mellitus. Int J Pharm Biol Sci 2015;5:24-30. Chandel K, Singh RB, Kumar S, Gupta A, Nath K. Evaluation of thyroid hormone dysfunction in patients of type 2 diabetes mellitus. Indian J Clin Anat Physiol 2016;3:21-3. Chandrashekhar HR, Shekar HS, Fakruddin M, Deepika N, Himanshu C, Kadaei R, et al. Study of prevalence of diabetes mellitus among patients suffering from thyroid disease. J Med Sci Clin Res 2017;5:17909-13. Chaturvedi S, Nagtilak S, Parashar P, Rastogi A, Gupta A. Thyroid dysfunction and it's relation with type 2 diabetes mellitus in Meerut. Int J Sci Res 2016;7:305-7. Datchinamoorthi S, Rathanavel N, Rajagopalan B, Vanaja R. Study of thyroid dysfunction in type II diabetes mellitus. Int J Pharm Sci Res 2016;7:3877-80. Deuri A, Thakuria J, Kalita D. A prospective study of thyroid dysfunction in patients with type 2 diabetes mellitus in a tertiary care hospital (Faamch, Barpeta, Assam, India). IOSR J Dent Med Sci 2016;15:21-5. Jain G, Marwaha TS, Khurana A, Dhoat PS. Prevalence of Thyroid disorders in Patients of type 2 Diabetes Mellitus. Int J Med Dent Sci 2013;2:153-61. Jali MV, Kambar S, Jali SM, Pawar N, Nalawade P. Prevalence of thyroid dysfunction among type 2 diabetes mellitus patients. Diabetes Metab Syndr 2017;11 Suppl 1:S105-8. John M. Burden of thyroid diseases in India, need for aggressive diagnosis. Med Update 2008;18:334-41. Ingle PV, Patel HA, Dighore PN, Patil PH. Clinical Impact of Thyroid Dysfunction in Patients with Diabetes Mellitus. Int J Pharmaceut Chem Sci 2014;3:327-34. Kaeley N, Bhatia R, Dhar M, Verma SK, Ahmed S. Association of thyroid disorders and type 2 diabetes mellitus – Beyond co-incidence-a hospital based study from sub-Himalayan region. Natl J Med Allied Sci 2015;4:19-25. Manjunath SC, Krishnamurthy V, Puttaswamy BK, Prabhu S, Vishwanathaiah PM. Prevalence of subclinical thyroid disorders in type 2 diabetes mellitus. Int J Med Public Health 2013;3:330-4. Mawar A, Kare PK, Mishra KP, Chahar RK. Study of thyroid dysfunction in type 2 diabetes mellitus patients of Agra city. Int J Biomed Res 2016;7:26-9. Mishra S, Mishra S, Behera BK. Thyroid dysfunction in patients with type-2 diabetes mellitus in Eastern India. J Pharm Biomed Sci 2016;6:311-4. Nandyala V, Gandiah P, Sivarajappa P, Indira G. Thyroid disorders in type 2 diabetes mellitus. Int J Rec Trends Sci Technol 2013;9:250-5. Padmini O, Sumanth V, Sri Divya V, Rama DM. Association of thyroid dysfunction with type 2 diabetes: A prospective study. J Evol Med Dent Sci 2015;4:5292-307. Patel JC, Dhirwani MK. Incidence of diabetes in Bombay. Indian J Med Sci 1958;12:10-4. Pramanik S, Ghosh S, Mukhopadhyay P, Bhattacharjee R, Mukherjee B, Mondal SA, et al. Thyroid status in patients with type 2 diabetes attending a tertiary care hospital in Eastern India. Indian J Endocrinol Metab 2018;22:112-5. Ramachandran A, Snehalatha C. Current scenario of diabetes in India. J Diabetes 2009;1:18-28. Ravishankar SN, Champakamalini, Venkatesh, Mohsin. A prospective study of thyroid - dysfunction in patients with Type 2 diabetes in general population Arch. Arch Med 2013;5:1-9. Saroj U, Kumar A. Prevalence of hypothyroidism among diabetes mellitus. Indian J Appl Res 2018;8:62-3. Satyanarayana N, Ashoka, Mudda A, Seetaram, Kumar J. Prevalence of Thyroid Dysfunction in Patients with Type 2 Diabetes Mellitus in Tertiary Care Centre. J Evol Med Dent Sci 2014;3:4160-6. Singh G, Gupta V, Sharma AK, Gupta N. Evaluation of thyroid dysfunction among type 2 diabetic Punjabi population. Adv Biores 2011;2:3-9. Thakkar N, Jain SM. The impact of diabetes on thyroid dysfunction and outcomes in a native Indian female population. Thyroid Sci 2011;6:1-9. Uppal V, Vij C, Bedi GK, Vij A, Banerjee BD. Thyroid disorders in patients of type 2 diabetes mellitus. Indian J Clin Biochem 2013;28:336-41. Vikhe VB, Kanitkar SA, Tamakuwala KK, Gaikwad AN, Kalyan M, Agarwal RR. Thyroid dysfunction in patients with type 2 diabetes mellitus at tertiary care centre. Nat J Med Res 2013;3:377-80. Pasupathi P, Bakthavathsalam G, Saravanan G, Sundaramoorthi R. Screening for thyroid dysfunction in the diabetic/non-diabetic population. Thyroid Sci 2008;3:CLS1-6. Perros P, McCrimmon RJ, Shaw G, Frier BM. Frequency of thyroid dysfunction in diabetic patients: Value of annual screening. Diabet Med 1995;12:622-7. Prasad D, Devasena I. The thyroid profile in type 2 diabetes mellitus and its significance. Int J Sci Res 2014;3:1-3. Raghuwanshi PK, Rajput DP, Ratre BK, Jain R, Patel N, Jain S. Evaluation of thyroid dysfunction among type 2 diabetic patients. Asian J Med Sci 2015;6:33-7. Suzuki Y, Nanno M, Gemma R, Tanaka I, Taminato T, Yoshimi T, et al. The mechanism of thyroid hormone abnormalities in patients with diabetes mellitus. Nihon Naibunpi Gakkai Zasshi 1994;70:465-70. Swamy RM, Kumar N, Srinivasa K. Evaluation of hypothyroidism as a complication type II diabetes mellitus. Biomed Res 2012;23:170-2. Taksali R, Bindu SM, Mulay S. Evaluation of thyroid dysfunction in type ii diabetes mellitus: A case control study. Int J Curr Med Appl Sci 2013;1:16-20. Witting V, Bergis D, Sadet D, Badenhoop K. Thyroid disease in insulin-treated patients with type 2 diabetes: A retrospective study. Thyroid Res 2014;7:2. Kumar A, Goel MK, Jain RB, Khanna P, Chaudhary V. India towards diabetes control: Key issues. Australas Med J 2013;6:524-31.